Harvesting heat produced by a car's engine which would otherwise be wasted and using it to recharge the car's batteries or powering the air-conditioning system could be a significant feature in the next generation of hybrid cars. The average car currently loses around 70% of energy generated through fuel consumption to heat. Utilising that lost energy requires a thermoelectric material which can generate an electrical current from the application of heat. Thermoelectric materials convert heat to electricity or vice-versa, such as with refrigerators. The challenge with these devices is to use a material that is a good conductor of electricity but also dissipates heat well. Currently, materials which exhibit these properties are often toxic and operate at very high temperatures – higher than that produced by car engines. By adding graphene, a new generation of composite materials could reduce carbon emissions globally from car use. Scientists from The University of Manchester working with European Thermodynamics Ltd have increased the potential for low cost thermoelectric materials to be used more widely in the automotive industry. 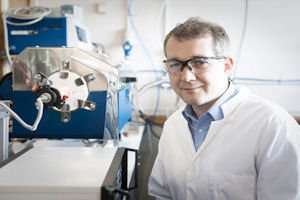 The team, led by Prof Ian Kinloch, Prof Robert Freer and Yue Lin, added a small amount of graphene to strontium titanium oxide. The resulting composite was able to convert heat which would otherwise be lost as waste into an electric current over a broad temperature range, going down to room temperature. Prof Freer said: "Current oxide thermoelectric materials are limited by their operating temperatures which can be around 700 degrees Celsius. This has been a problem which has hampered efforts to improve efficiency by utilising heat energy waste for some time. "Our findings show that by introducing a small amount of graphene to the base material can reduce the thermal operating window to room temperature which offers a huge range of potential for applications. "The new material will convert 3-5% of the heat into electricity. That is not much but, given that the average vehicle loses roughly 70% of the energy supplied to it by its fuel to waste heat and friction, recovering even a small percentage of this with thermoelectric technology would be worthwhile." The findings were published in the journal ACS Applied Materials and Interfaces. Graphene's range of superlative properties and small size causes the transfer of heat through the material to slow leading to the desired lower operating temperatures. Improving fuel efficiency, whilst retaining performance, has long been a driving force for car manufacturers. Graphene could also aid fuel economy and safety when used as a composite material in the chassis or bodywork to reduce weight compared to traditional materials used.